Bordeaux’s beauty and great quality of life has been attracting more and more people and business opportunities the past few years, and most of the newcomers are freelancers, entrepreneurs, or otherwise represent new business opportunities to boost the city’s economy. 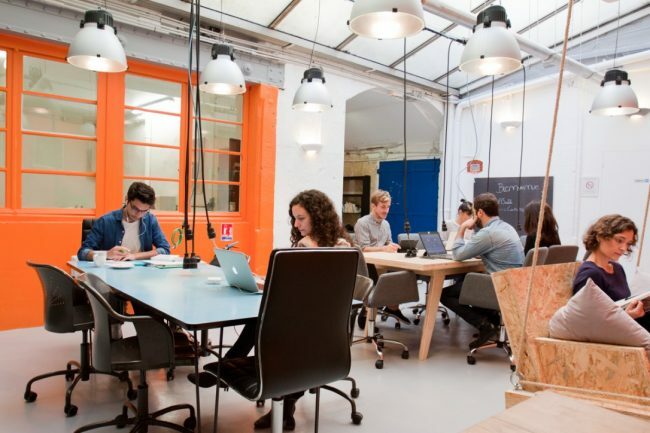 Sharing a working space with other people eases the loneliness of building a project alone in a flat, is a great way to meet new people (and maybe even a business partners); so for nomads working in or visiting Bordeaux, here are 10 of the top co-working places in town. Located in the very chic “Triangle d’or” District, the warm welcome of Eric the mastermind behind Wigi Bordeaux will immediately make workers feel at home. This smartly-designed open space also has access private-meeting rooms if needed and two renovated caves downstairs. 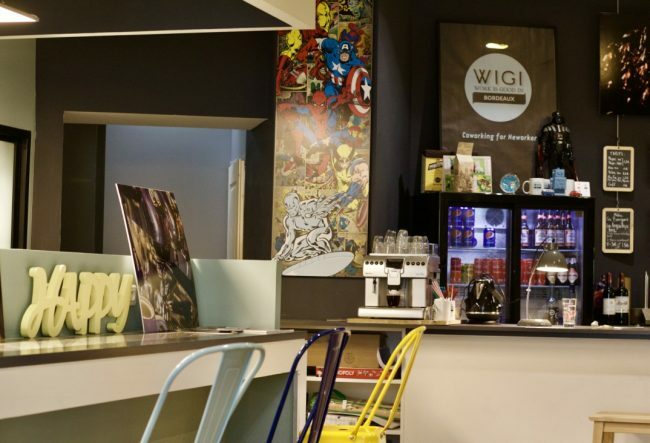 The décor is luminous with a touch of humor (thanks to comic figures painted on the wall) and perfectly matches Wigi’s philosophy: professionalism in a friendly and relaxed atmosphere. Pay for the time spent there (€3.85 ($4.39) an hour), have free access to amenities (drinks and snacks), and practice yoga or Pilates in one of the renovated caves’ training lounges downstairs. Wigi also organizes theme-based events on a regular basis that are another great way meet people in a professional yet very friendly environment. A freelancer and foodie? Look no further than Le Buro des Possibles (the office where everything is possible). In the animated Saint Michel District, workers will love this beautiful and colorful place and the super-friendly staff. Before starting on work, sit in the coffee area and try their granola for a healthy breakfast or a slice of their delicious cakes as a treat. After that, move to their working space or to the Buro des Possibles’ meeting room,”Le Cocon”, which fits up to 10 people. For €20 ($22.79) per day (€16 ($18.23) for students), workers have access to all the space and can eat as many of their yummy snacks as they wish. Come to La Bicoque for coffee or to work. 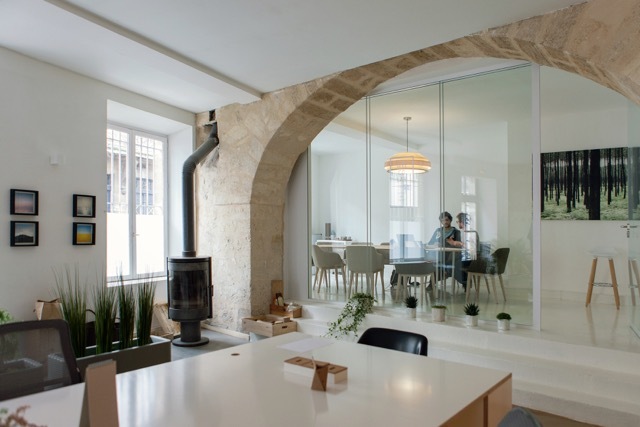 There is a real sense of peacefulness reigning in this quiet co-working space located in the heart of the city and only few steps away from the Hotel de Ville (the Mayor’s office). There are several formulas available for one-time guests and daily users alike. Regulars and newcomers cross paths in a very smooth way, and that is certainly reinforced by the kindness of the owner, Maud, who reinforces La Bicoque’s serene atmosphere. On the corner of the trendy rue Ste Colombe, Le Bac à Sable is a spacious and vibrant working café that stands out by its heterogeneity. Very practical, it was created to give people the best conditions to work under. Work stations include high and low tables for those who want the feel of a real office as well as couches and swing chairs for those who want to feel at home. It has a time-based fee, but there are also daily (€20) ($22.79), weekly (€75) ($85.47), or monthly (€250 ($284.90) with a 10% discount for students) fees for those working on a longer project. Coffee, tea, and tasty biscuits are included in the price, and feel free to look for some inspiration in their tiny but rich library. 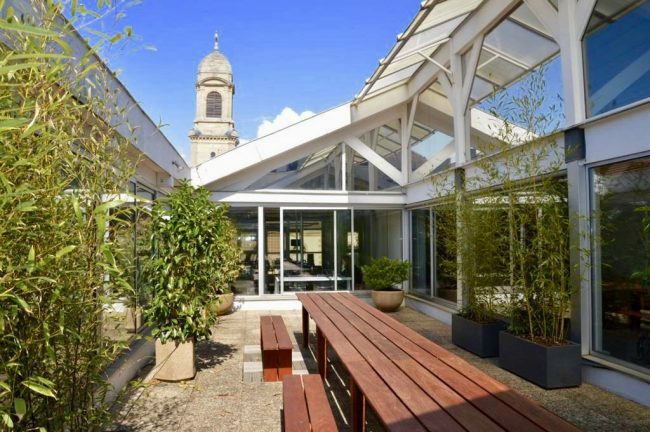 Close to Bordeaux’s Chamber of Commerce, the Node-Aquinum is a co-working space dedicated to digital workers with a very competitive price of €250 ($284.90) per year. It is a great deal for a digital entrepreneur on a budget. If the membership is pretty inexpensive, it doesn’t have a negative impact on the services offered by the staff. Supported by Aquinum, an association that links all the digital professionals in the Aquitaine region, the Node is a fantastic environment for networking and collaboration. In addition to that, the regular networking are great occasions to build a portfolio and socialize at the same time. Atelier Zélium is a collaborative design and manufacturing facility located in the heart of Bordeaux. Not a typical workplace, it is dedicated to the craft industry. 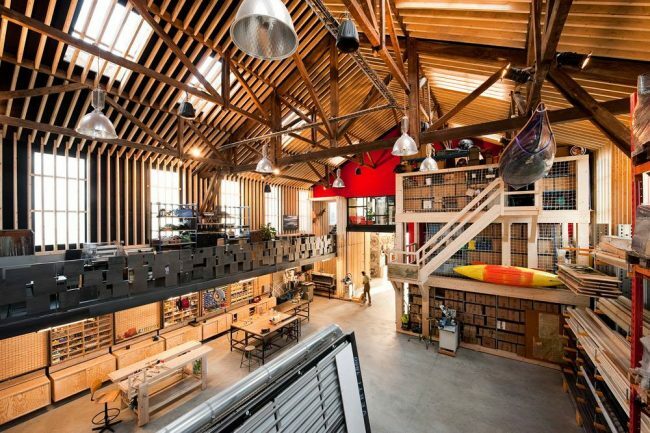 This incredible-looking structure has two main activities: conception/creation and co-working. On one hand, the staff creates décors, furniture, and many other objects for architects, designers, and the entertainment industry. On the other hand, it is also a space in which people can use the high-quality machines from the atelier to develop their projects with the help of experienced and talented professionals. The Atelier Zéluim’s cordial atmosphere will definitively suit anyone. In the praised Les Chartrons neighborhood, Weecolab is a medium-size co-working space suitable for digital entrepreneurs. The amazing stone architecture gives great character to this venue. Highly functional, Wecoolab has 12 desks with high-speed internet, a meeting room, and a nice kitchen for lunch breaks though there are many good restaurants nearby. The main advantage of this place is that subscribers have a 24-hour access 365 days a year, so those who get inspired at 3am won’t have to wait until the next morning to work on a project. There are several reasons to enjoy working in La Girafe’s co-working space in the popular Les Chartrons neighborhood. The luminous offices that will cheer workers up even on the gloomiest-winter days. In addition to the numerous desks available in the open space, there are also two meeting rooms for those needing to meet with clients. As soon as the sunny days come back, work or spend the lunch break on La Girafe’s outstanding 70-meter square terrace. Those who use their lunch break to hit the gym, shower and feel fresh before starting up work again. One last thing, those not sure about joining La Girafe can enjoy a free trial for one entire day. For those who subscribe, the monthly membership costs €300 ($341.90) a month. 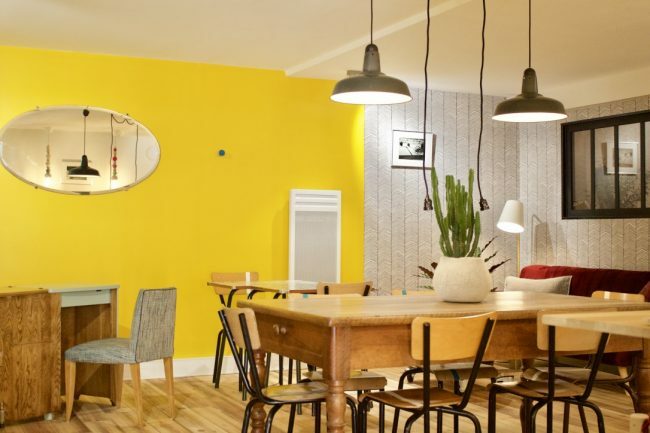 L’Odysée is only a three-minute walk from Gare Saint Jean train station and great for workers who plan on staying in Bordeaux for a while (minimum subscription is one month). It can host up to 20 people in an open space and has two closed offices for business meetings. Those needing to blow some steam off, there is a large room dedicated to everyone as well as an open space, two closed offices, and a large relaxation room. The Buro Club Bordeaux Quinconces et Grand Théâtre belongs to a total of 145 offices worldwide. Its two working spaces in Bordeaux are in two prestigious areas of the city: the Grand Théâtre and the Quinconces, one of Bordeaux’s most visited attractions. Workers joining the Euro would benefit from the network’s extensive expertise and will be exposed to various solutions to improve their business. Memberships start at €295 ($336.20) per month which includes closed-working spaces and the possibility for workers to use the Buro Club’s address.